You are here: Home / computer problems / Windows Wont Boot – What Can I do? Windows Wont Boot – What Can I do? What will YOU do when Windows Wont Boot? I’m sure that you like myself, use your computer for many different reasons such as: listening to music, watching movies, checking email, working and more. When Windows won’t boot, it seems as your entire life flashes in front of your eyes! When Windows wont boot, I always check the power cord located on back of the computer (desktops). When my laptop doesn’t boot, I always look at the power adapter first, To ensure the connection is correct both into the wall, and the cord from the wall plugging into the unit. You may be thinking… “DUH”, but you would not believe the vast majority of people who have non-booting computers simply due to a loose cord! Once you have verified power is flowing into your PC, you can proceed to checking the next thing. Another possibility to troubleshoot when Windows wont boot up, is checking the voltage of the power unit. Power supplies have voltage switches that can be changed to the appropriate voltage for your region of the planet. For instance, here in North America, we used the 115V option, while in Europe and its surrounding areas, you need to use the 230V option. 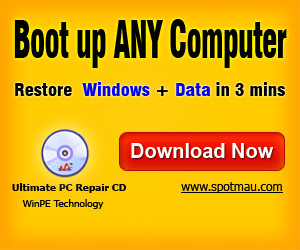 Boot up Any Computer, Fix & Install Windows Easy. Believe it or not, I have seen several instances where a customer would contact us to “repair” their computer, only to realize ONE minute after arriving to the person’s location, the voltage switch needs to be changed and nothing else! Always be sure to check that switch either on your power adapter (laptops), or power supply (desktops), before going any further in troubleshooting. #3. Are you seeing anything on the monitor? The first thing you naturally do when troubleshooting a computer problem, is looking at your monitor. Let’s get a little more involved in paying attention to the monitor (or screen), in this case. Do you see anything at all on the monitor or is it “black”? Do you see the “power light” illuminating? Is it blinking? Is it green colored or amber colored? NOTE: a blinking power light on a monitor indicates several things not limited to: the monitor is either in hibernation/sleep mode, is disconnected from the video output, or has the incorrect resolution set. Would you guess that many people complain that Windows wont boot up, only to find that the monitor was either not powered on, or wasn’t plugged into the computer properly! In summary, always pay attention to what clues your monitor may be leaving you, when troubleshooting. #4. Do you hear or see any fans spinning, or lights blinking? When you turn on your computer, are any of the fans spinning or even the power light blinking? Does the computer’s hard drive activity light blink to show activity? If you notice no fans spinning,and there is no hard drive movement (which you can either listen for, or check by looking at the disk activity light on the PC), you may have a hardware related issue, or there may be an issue with your power connection (cord/adapter), or your surge protector, or your AC outlet (or a combination of all these). Before you panic thinking Windows wont boot up, check your power cords first, since they are usually the reason for computers that don’t power up successfully. When your PC has no fan movement, is making no sounds, and otherwise won’t boot; there is a hardware issue that should be inspected by a professional or experienced technician to avoid further damage. When Windows Wont Boot and you have problems with your computer that is detected by the BIOS (Basic Input Output System), there will be a series of beeping sounds, immediately after turning on your PC. You might see a black screen on your computer along with the beeping sounds when you try to power up the computer. Beep codes vary in the intervals and duration of the beeping, but any beeping sounds that doesn’t occur normally (such as a quick beep upon booting), that ALWAYS spells a hardware issue that needs to be addressed. A general rule of thumb is to stay tuned to any beeping when you power up your computer. You will only hear the “problem beeps” when a problem exists that needs to be fixed, so make sure that you don’t throw away or misplace your computer owner’s manual (or motherboard owner’s manual); it will come in handy when you need help figuring out those dreaded beeps! Shortly after turning on your computer, do you see a logo at all? Computers all go through a POST; also know as a Power On Self Test, when they are booted. At this stage, a computer detects all of the hardware needed to function, as well as other checks to ensure proper operation. During POST, you can usually just see a logo and text on the screen, usually in multiple colors or white. If you get to this screen, your computer is at least booting – CONGRATS! There are ways to fix boot errors by using POST to diagnose the problem. If your PC doesn’t get past the POST screen, and either gets “caught” before, after or during the Windows logo showing, it has booted but Windows hasn’t loaded. If your computer restarts, shuts down, freezes on a black or gray screen, or BSODs (blue screens), your problem is software (Windows) related, and not necessarily hardware related. When a computer has a software problem, it can usually be fixed by an experienced person, without the need to order expensive hardware. Did you know that if you have a Windows Vista or Windows 7 installation disc and Windows will not start at all, you can run “start-up repair” if you experience this problem? Also, if you have Windows XP, there is a “repair installation” function that will allow you to easily repair your computer to load Windows successfully! If you don’t have the installation disc for your operating system, you can either borrow one or let an experienced person take a look at it to decipher the problem. Please be aware that virus and other malware infecting your computer can cause this issue. To learn how to remove viruses like a professional and solve virus related booting problems, click here for the virus removal manual. When Windows wont boot there are so many possibilities. How to Deal With the Windows Blue Screen Error? 4 year old Slimline that I know that onboard GeForce 6150SE is going or gone. When I power up now I don’t even hear one beep, the one that says that Windows loaded. Will a completely fried onboard chipset cause Windows not to load because I know a lot more than just graphics are controlled by the chipset. Also when I power up the monitor acts like it’s coming out of stand with a green light, then turns amber after a couple of seconds and goes blank. There are already huge list of errors that forces windows to restart again and again. Out of which, hard drive is the most sensitive part to this and contributed most towards starting failure. However, thanks for some other helpful ways which we can try in case of inaccessible Windows. Right on target! All of these are important steps when trouble shooting my pc. usually it’s the virus or the memory card has not been tightly placed. I had the same problem once and went out and bought a contact cleaning spray (rated for electronics) (without oil). All went smooth from then on. Again every problem might have a different cause so I don’t know if this would help you. It is risky and I do not recommend it but I did it. For a safer alternative you could blow some pressurized air to the contacts. I encountered one of this problem before when I went for a long holiday and did not power up my computer for some time. It was the RAM issue at that time that cause my computer not able to boot. What I did was to remove my RAM and slot it back in. Not too sure why it works but it happened to me quite often when I go for holiday.